"We, amnesiacs all, condemned to live in an eternally fleeting present, have created the most elaborate of human constructions, memory, to buffer ourselves against the intolerable knowledge of the irreversible passage of time and the irretrieveability of its moments and events." Sonnabend did not attempt to deny that the experience of memory existed. However, his entire body of work was predicated on the idea that what we experience as memories are in fact confabulations artificial constructions of our own design built around sterile particles of retained experience which we attempt to make live again by infusions of imagination - much as the blacks and whites of old photographs are enhanced by the addition of colors or tints in attempt to add life to a frozen moment. Sonnabend believed that long term or "distant" memory was illusion, but similarly he questioned short term or "immediate" memory. On a number of occasions Sonnabend wrote, "there is only experience and its decay" by which he meant to suggest that what we typically call short term memory is, in fact, our experiencing the decay of an experience. Interestingly, however, Sonnabend employed the term true memory, to describe this process of decay which, he held, was, in actuality, not memory at all. Sonnabend believed that this phenomenon of true memory was our only connection to the past, if only the immediate past, and, as a result, he became obsessed with understanding the mechanisms of true memory by which experience decays. In an effort to illustrate his understanding of this process, Sonnabend, over the next several years, constructed an elaborate Model of Obliscence (or model of forgetting) which, in its simplest form, can be seen as the intersection of a plane and cone (1.1). It is this model that Sonnabend first came to understand during the sleepless night in September, 1936, at the Iguassu Falls. By the end of his life this model reflected a complex of forms and designations including such terms as the cone of confabulation, the perverse and obverse atmonic discs, spelean ring disparity and the attitude and altitude of experience(1.2). In its most basic form Sonnabend's model of obliscence consists of two elements: the Cone of Obliscence and the Plane of Experience (sometimes also known as plane experience). All living things have a Cone of Obliscence by which the being experiences experience. This cone is sometimes also known as the Cone of True Memory (and occasionally the Characteristic Cone.) Sonnabend speaks of this cone as if it were an organ like the pancreas or spleen and like those organs its shape and characteristics are unique to the individual and remain relatively consistent over time. This cone (occasionally referred to as a horn) is composed of two elements - the Atmonic Disc (or base of the cone) which Sonnabend described as "the field of immediate consciousness of an individual" and the "hollows" (or interior of the cone). A third implied element of the Characteristic Cone is the Spelean Axis, an imaginary line which passes through the tip of the cone and the center of the Atmonic Disc. The Spelean Axis can be thought of as the individual's line of sight or perspective, with the eye of the individual firmly held at the intersection of the Spelean Axis and the Atmonic disc. The second element of the basic Sonabend diad <196> the Plane of Experience is far more dynamic. Planes of Experience are always in motion, always (in Class I planes) moving from the Obverse Experience Boundary (or leading edge) to the Perverse Experience Boundary (or trailing edge). (3) having forgotten an experience. Under "normal" circumstances, the Obverse (or leading) Experience Boundary is the first element of the plane to cross the Atmonic Disc. This situation creates the condition we describe as being involved in an experience. Once the Obverse Experience Boundary clears the Atmonic disc we say that we remember the experience. And when the Perverse Experience Boundary clears the cone altogether, and we no longer "truly remember" the experience and we say we have forgotten the experience. From our perspective, at the intersection of the spelean axis with the atmonic disc, this series of events is seen as a progressively constricting or diminishing disc - in other words experiences pass and memories fade. Every Experience Plane has a pitch or attitude as well as an altitude. The pitch of a plane can be thought of as the angle at which it comes into contact with a particular cone. This pitch effects the length of the decay of the experience. Similarly, the altitude of a plane can be can be seen as the elevation of the plane in relation to a particular cone. The altitude of the plane effects the apparent intensity (or brightness) of the experience in question. Group 4 between 174 and 180 degrees of arc. Beyond 180 degrees a plane reverts back to a Group 1 plane (but changes to Class II which will be discussed later). Clearly, a Group 1 Experience Plane with a vertical or nearly vertical experience pitch passes through the cone (and, accordingly, from memory) far more rapidly than a Group 2 plane with, for example, a 53 degree experience pitch. A normal individual under normal circumstances is primarily aware of Group 1 and Group 2 planes with the great predominance being Group 2. According to Sonnabend, however, there is absolutely nothing to indicate that the population of planes is not evenly dispersed among the groups and classes - which is to say that for every Group 2 plane there exists and Group 3 plane and for every Group 1 plane there exists a Group 4 plane as well. The great majority of volume three of Obliscence, Theories of Forgetting and the Problem of Matter is devoted to the discussion of Group 3 and 4 planes as well as the whole world of Class II, or negative experience pitch planes, in which the Perverse Experience Boundary in fact leads the Obverse. The Group 3 & 4 planes, in conjunction with the Class II planes, make up, according to Sonnabend a full three quarters of the experience of everyday life. Yet, because of the nature of the construction of these experiences, we are, by and large, unaware of, even, their existence. When we are aware of these experiences they appear to us as fleeting or insubstantial and we ascribe to them such names as premonition, Deja vu and forebodings. It is precisely this area of Sonnabend's work that has, on the one hand, caused such controversy while, on the other, provided a structure and a vocabulary with which to discuss these often difficult experiences. For example, let us consider the case of a Class I, Group 3 plane. 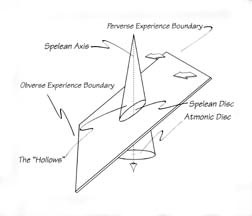 In this case, the Obverse Experience Boundary is still the leading edge of the plane, however, its first point of contact with the Characteristic Cone is not the Atmonic Disc, as is the case with "normal" Group 1 and 2 experiences but, the Obverse Experience Boundary, in fact, first contacts the cone's "hollows", that part of the cone with which we associate the sensation of memory. Accordingly this class of experience has a quality of being pre-remembered or foreshadowed. This discussion has only been able to outline in the broadest of strokes the extraordinarily detailed and far reaching work of Geoffrey Sonnabend. A more thorough and detailed study of Sonnabend's work offers its student rich rewards as well as many surprises.